We designed this perforated hardboard tool storage system to help you stay organized in your workshop. 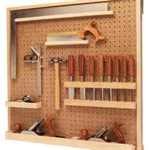 The system consists of a framed hanging tool board sized to suit your needs and eight specialized tool holders made from scrap wood. Completely customizable to store your tools the way you want. Make on the cheap use scrap wood.